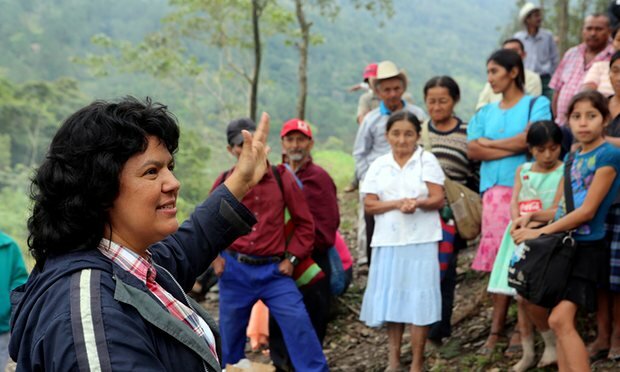 How would you describe Berta Cáceres? A journalist recently asked me. Indeed, how to describe someone’s life? The press in Honduras, refer to Cáceres as an environmentalist, though not necessarily with a positive meaning, as it can be portrayed as a person opposing all development and even rights of people to their livelihoods. But Berta was much more than this kind of environmental defender, as she was working for both protection of nature and defending indigenous rights and culture - promoting living in harmony with nature. Like many people in Honduras and around the world, I was angered and saddened by her murder, and the attacks on fellow activists in Honduras. One way to show solidarity and support for their struggle was a trip to Honduras, to participate in the international gathering Berta Vive! 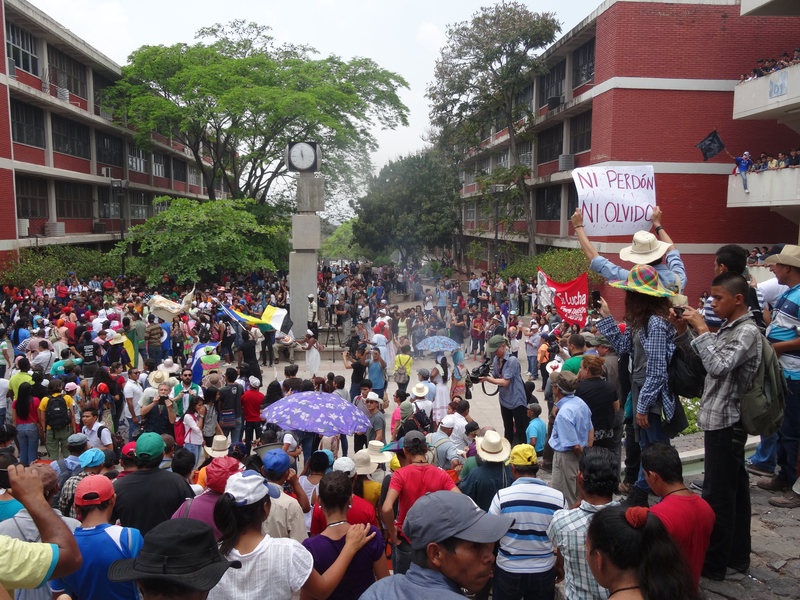 From April 13th to 15th, 2016, close to 1,500 people from grassroots social movement organizations in Honduras, and delegations from 22 countries and international organisations participated in the Berta Cáceres Lives International Peoples’ Summit. This gathering in Tegucigalpa and Rio Blanco, Honduras, gave us a chance to debate, share and reflect on the best way forward. Friends of the Earth International was also present with a delegation to show solidarity with Berta Cáceres family, activists of her organization (COPINH) and the people of Honduras. The gathering had several demands and objectives. 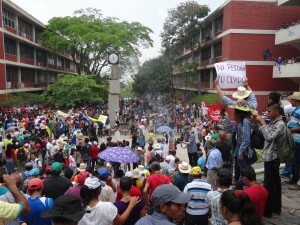 These included justice for Berta, which requires an investigation that takes into account the political context of her assassination; a withdraw of the DESA corporation from Lenca territory; withdraw of the military from indigenous territory and grassroots communities; and strong support for COPINH and similar indigenous and community organizations. We spent this inspirational three-day gathering discussing the situation in Honduras, and how we can support the work of COPINH and other indigenous environmental defenders. On the last day, while visiting the river Gualcarque and community Rio Blanco, we witnessed the threats that COPINH activists are receiving on daily basis and inaction of police in protecting them. Indeed, Honduras, with its violence and impunity for those that commit it against activists, is not an easy place to live for the most of people, activists in particular. There is plenty of poverty in a country that has huge inequality gap, both of which increased after the Coup d’etat in 2009. For example, in the two years after the coup, over 100 percent of all real income gains went to the wealthiest 10 percent of Hondurans. Honduras was named the most dangerous country in the world for environmental activists, according to a 2015 Global Witness report , with indigenous rights defenders particularly at risk. COPINH resistance to the expropriation of land and river for the dam in these circumstances is an extraordinary achievement, and it is no surprise their leaders are targeted. Among other organisations, Friends of the Earth International has showed solidarity with them in different ways, including when they were falsely prosecuted in 2013. Murders are only tip of the iceberg in terms of pressure indigenous communities, such as the Lenca, face when defending their territory. The pressure comes both from state and investors. It comes in the form of threats, bribery, kidnapping, false prosecutions, physical abuse, and murder. With all of these being reported internationally regarding the Aqua Zerca dam, it is sadly ironic that the European investors FMO and Finfund, only suspended their investments in the project after the two the most recent and internationally reported murders of COPINH leaders (Berta Caceres and Nelson Garcia) in mid-March this year. The pressure now needs to increase on the Central American Bank for Economic Integration (CABEI) to pull out too, and on DESA and the Honduran government. This is the least we can do to support the struggle of COPINH, and to celebrate Berta’s life. When one considers situation in Honduras, the murder of Berta Caceres should not have come as surprise. Perhaps, naively we believed that the international recognition and visibility of her work would protect her. But those who killed her wanted to show us that no one is safe. They wanted to spread fear and perhaps they succeeded in that. On the other hand, they also showed clearly the brutal face of a system that values profits much more than life, and some lives more than others. It showed us that until we change these values, 99% of us will never be truly safe and that we need act together in solidarity. The news today of arrests is encouraging. I am not surprised to read that people affiliated with DESA (the company behind the Agua Zarca dam project which Berta died opposing) are among those arrested. There should be further investigation to ensure that all those involved are brought to justice. This will not bring Berta back, but it will be of comfort to her family and help challenge the culture of violence against activists in Honduras. The story of Berta Cáceres is a story of resistance against privatisation, colonisation and capitalism. It is story of defending land and water, sustaining life. Berta Caceres has showed us a way to live and fight. Or to put it in her own words: “Wake up people time is running out!” As long as we follow her path, she will live! Watch: Short animation about the Agua Zarca dam. Sign: Support the struggle of these Honduran activists.